Call Dragon is a dragon shout that summons Odahviing to fight alongside you, but only if it is used outdoors. After shouting all three words, there will be a short delay, then Odahviing will arrive at your location. Odahviing is essential, and will not leave your vicinity until you are out of combat, making this shout particularly useful for difficult fights. 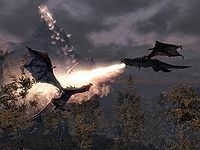 All three words of this shout are learned during The Fallen, after which Odahviing will not respond again to this shout until the main quest is complete. Using the wait function right after shouting and before Odahviing spawns should cause him to appear after using the wait function, nullifying the long cooldown period. Odahviing will not come if you use the shout on SolstheimDB but will still activate the cooldown timer. This page was last modified on 24 June 2018, at 18:32.